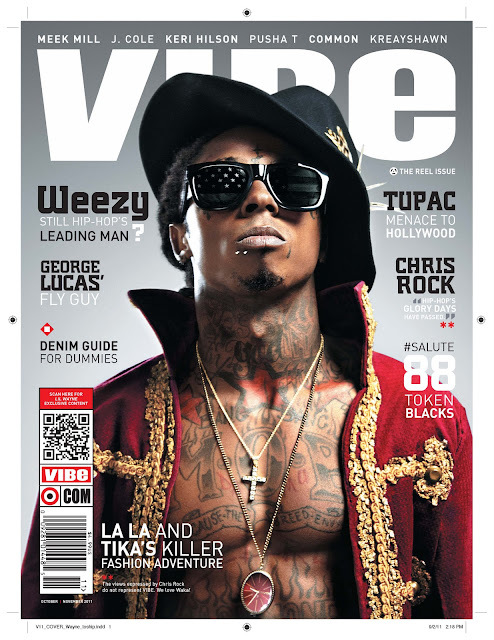 Say Somethin': Weezy Covers VIBE Magazine & talks London Riots. I really have NO comment on this cover but check out what Weezy had to say about the London Riots after the jump! "VIBE: Given that Cash Money artist Jay Sean is a native of the U.K., you probably have some strong feelings about the London riots and how some talking heads blamed it on hip-hop culture. LIL WAYNE: All you could do is pray for the people that were dealing with the situation and hope for the best. As far as them blaming hip-hop, you can blame Jesus for things, so you can't really fault anybody for blaming someone or something. All you can do is hope for the best. " Anyway pick up a copy of Lil' Wayne's October/November Vibe cover now!